Nokia's Windows Phone 7 prototype, code-named Sea Ray, has been leaked again in a very clear, very thorough video from one of the company's manufacturing plants. The video shows an anonymous demonstrator removing the handset from its boxy protective casing and demonstrating the hardware features before turning the handset on to show off the Mango-flavoured operating system. There's also a brief demo of the camera, complete with shutter button. 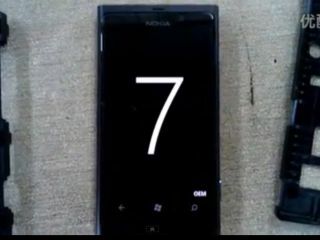 The handset was first "leaked" when a video of CEO Stephen Elop showing it off landed on the internet in June (not long after the company announced the MeeGo-running Nokia N9, to which Sea Ray is almost identical). We're not saying Nokia is definitely "leaking" these photos and videos on purpose, but when Elop makes comments like "This… is super confidential. We do not want to see it out in the blogosphere" you know a marketing department has been involved somewhere along the line. That, and the fact that this video is so clear and thorough, makes us suspect it's not just the product of factory workers gone rogue.